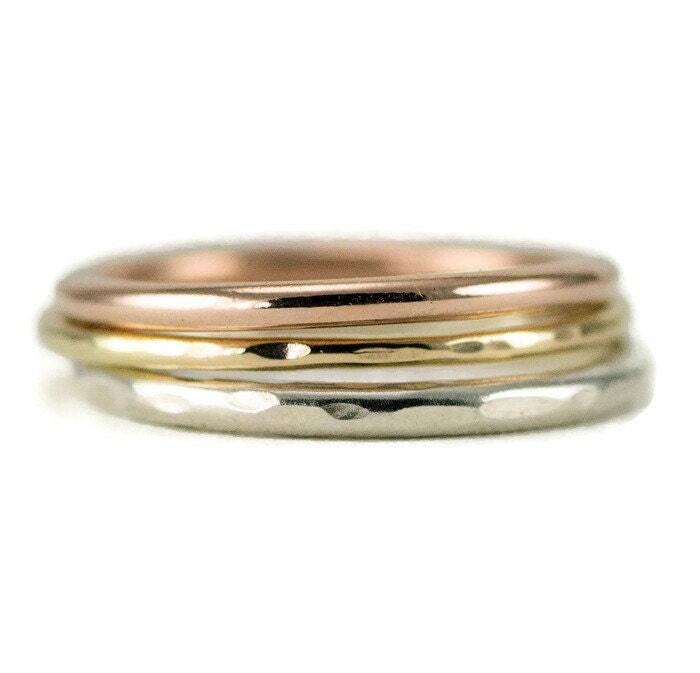 This beautiful solid 14k gold stack ring set is created with a trio of hammered 14k yellow, rose and white gold bands in your choice of full round or square wire. Choose your set of 3 gold stacking rings as pictured or mix and match the colors you prefer. The tri-color gold ring set pictured is made with one of each color gold. I offer these rings in thin 1.6 mm, slender 1.3 mm and skinny 1 mm in hammered style either polished or satin finish. Square wire is offered in whisper thin 1 mm or slender 1.5 mm. Mixed color gold stack sets are extremely popular right now and always a classic look. Wear them all together or separately, this beautiful set of rings will become a staple in your jewelry wardrobe. Get your own set of bands in all 3 colors or just one color if you prefer. Each ring thickness is sold separately in my shop if you just want 1 ring. Choose your set by ring thickness, then choose your exact size. Please write your finish preference, polished or satin and any specific mix you'd like (example trio or 2 rose 1 white) in notes to seller at check out! Each of these 3 rings is solid 14k gold, not gold filled or gold plated. This means the 1 mm ring is 1mm x 1mm, width and thickness are the same, there is some variation to this when hammered. This listing is for US sizes 3 - 10 and all increments in between. Larger sizes 8-10 are priced slightly higher. I do recommend a slightly heavier 1.3 or 1.6 mm band for sizes 9 and up for more durability. Your ring will be custom made to your specifications. Please read my shop policies on custom orders and ring re-sizing and ask any questions before purchase. Since these are custom made just for you, please allow me time to make and ship your ring. This ring will normally ship within 5-7 business days. Each of my rings comes in a ring box suitable for gift giving. Included with your ring is a draw string pouch and a square of Sunshine polishing cloth to keep your jewelry sparkly! I love my ring! It is exactly what I had wanted. It stacks beautifully with my other rings. So pretty. Love this ring!! Will definitely be a return customer.